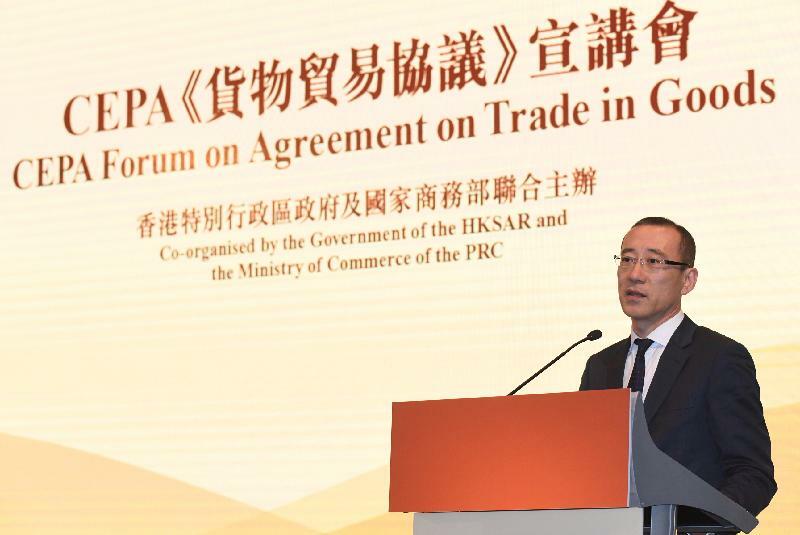 The Hong Kong Special Administrative Region (HKSAR) Government and the Ministry of Commerce of the Central People's Government jointly held the Mainland and Hong Kong Closer Economic Partnership Arrangement (CEPA) Forum on Agreement on Trade in Goods today (March 25). The Forum aimed at introducing to the trade details of the initiatives set out in the Agreement on Trade in Goods signed under the framework of CEPA on December 14, 2018, as well as the latest developments of the relevant trade facilitation measures. The Agreement on Trade in Goods has been implemented since January 1, 2019. The Permanent Secretary for Commerce and Economic Development (Commerce, Industry and Tourism), Miss Eliza Lee, and the Director-General of the Department of Taiwan, Hong Kong and Macao Affairs of the Ministry of Commerce, Mr Sun Tong, attended and spoke at the Forum. 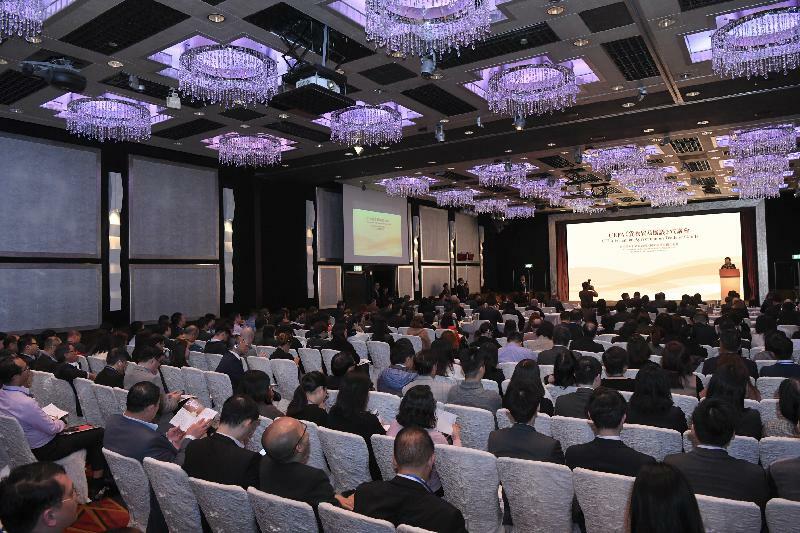 Over 200 people, including representatives from local and foreign trade bodies and Consulates General in Hong Kong, took part in the Forum. 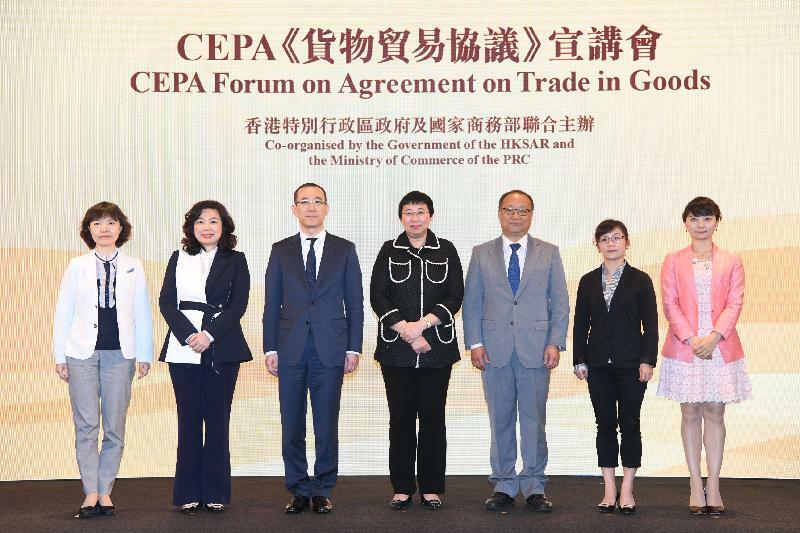 Representatives from central ministries and the HKSAR Government explained to participants the measures and implementation arrangements of the CEPA Agreement on Trade in Goods, and answered questions from the trade. 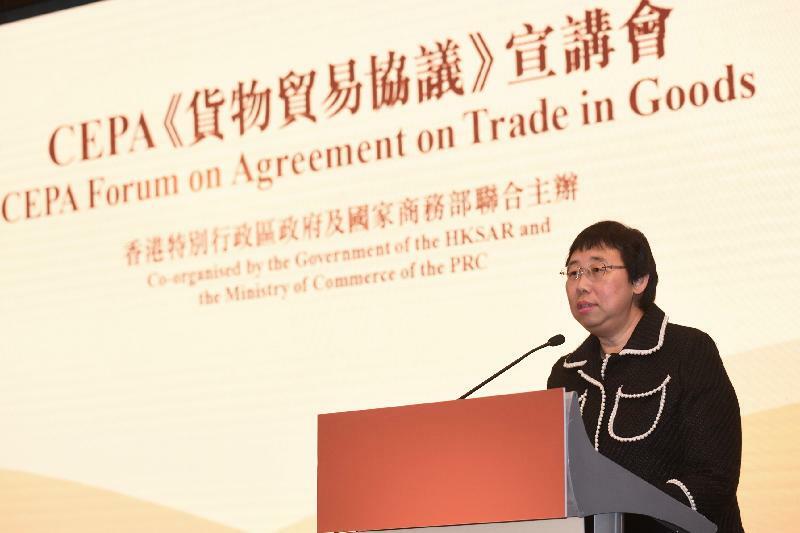 A representative of the Department of Duty Collection of the Mainland General Administration of Customs introduced the details of the full implementation of the zero tariff arrangement by the Mainland for imported goods of Hong Kong origin and rules of origin under the Agreement on Trade in Goods. Currently, all Hong Kong products can enjoy zero tariffs for export to the Mainland upon fulfilment of the CEPA rules of origin, thereby enhancing their competitiveness in the Mainland market. In addition, a representative of the Office of Hong Kong, Macao and Taiwan Affairs of the Mainland General Administration of Customs introduced the major responsibilities of the General Administration of Customs following the institutional reform of government agencies, as well as customs procedures and trade facilitation, sanitary and phytosanitary measures, technical trade measures and the latest progress of trade facilitation measures under the Agreement on Trade in Goods. The measures will help expedite customs clearance and reduce trade costs, making it easier for Hong Kong products to access the Mainland market. CEPA was signed in 2003. It is now a comprehensive and modern free trade agreement covering four major areas, namely trade in goods, trade in services, investments, and economic and technical co-operation. From 2004 to the end of February 2019, the value of Hong Kong products approved for export to the Mainland under the CEPA zero tariff arrangement exceeded $100 billion, and tariff savings amounted to about RMB6.95 billion.